You won't find it on iTunes, and even if you did, you certainly wouldn't wind up humming it all day. Still, the most talked-about song in the world  at least in astronomical circles  comes from a very unlikely performer: the sun. Scientists at Sheffield University in the U.K. have just released what amounts to a recording of what you would hear if you could stand inside the solar corona  the upper layer of the sun's atmosphere  and it turns out that what you'd hear is music. The simple symphony that fills the corona not only is beautiful but could also could yield new insights into how the sun operates. The corona is not just the blast wall of heat and light that it seems to be. Rather, it's filled with vaguely banana-shaped plasma structures known as coronal loops. Measuring up to 60,000 miles (about 100,000 km) long, the loops help keep the corona turbulent and, like ocean currents that eventually produce tidal waves, give rise to the cosmic fireworks known as solar flares. Coronal loops don't merely whip about randomly. They sometimes vibrate side to side and other times stretch and contract along their lengths. That's what a physicist would call transversal oscillations and longitudinal oscillations  and it's what a composer might call music. Transversal oscillations are precisely what happens when a guitar string is plucked; longitudinal oscillations are what happens to air when you puff into a wind instrument. Inside the sun, at least in theory, a two-piece ensemble ought to be constantly performing. To test this idea, a team led by Robertus von Fáy-Siebenbürgen, head of the university's solar-physics research group, compiled a catalog of high-resolution videos and still images of the sun shot by a number of satellite observatories. The scientists then used a computer algorithm that converted the visual data to acoustical information and sped up the frequency of the sound so it would fall within the human auditory range. If that seems like cheating, it's not; this kind of inferential algorithm is used to convert raw digital images from interplanetary probes into stunning color portraits, and while purists sometimes quibble over the exact shades of reds or blues, few deny the general accuracy of the pictures. If that's true of the solar research too, then the sun indeed is home to songs  albeit very short ones. The university has posted a six-second recording of what von Fáy-Siebenbürgen and his team extracted from their algorithm and has also linked to a YouTube post that includes images of coronal activity along with the audio. The sound might best be compared to the final chord from the Beatles' "A Day in the Life" crossed with a whale song. "It was strangely beautiful and exciting to hear those sounds for the first time from such a large and powerful source," von Fáy-Siebenbürgen told the London Telegraph. That's not to say the sun song is Grammy material, but it could one day earn scientific laurels. Improved understanding of coronal loops means improved understanding of solar physics as a whole. That, in turn, can help scientists better predict solar storms  those violent bursts of magnetic energy the sun produces periodically, wreaking potential havoc on earthly power grids and electronic communications. 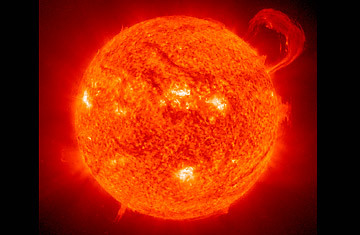 With NASA calling for a severe solar-storm season in 2013 and with more and more of the world becoming Web-, BlackBerry- and iPad-dependent, a major disruption could have serious implications. The university is including all of its new findings in its larger Project Sunshine program, a push to not just advance basic solar science but harness it to produce renewable energy. That's for later, of course. For now, the Sheffield website also allows you to upload and e-mail the soundtrack of the sun  which means a solar ringtone should not be far behind.